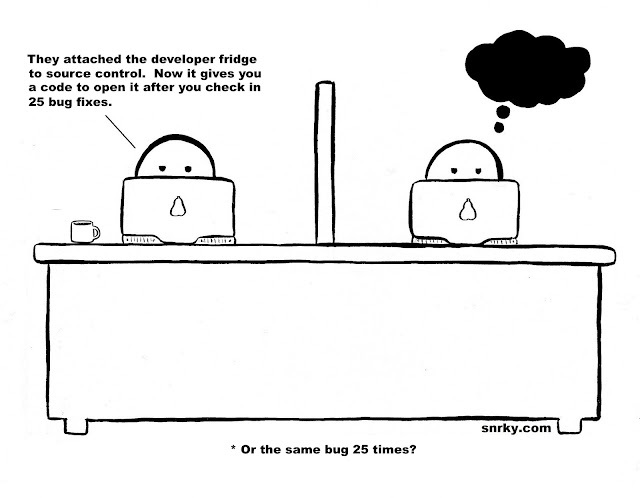 Snrky: Or the same bug 25 times? Or the same bug 25 times? I've always appreciated the concept of unintended consequences. The idea that the best laid plans can simply go to hell in the blink of an eye for reasons only obvious after it's too late is one of life's small ironies that keep our world interesting. I believe complexity is a major factor, which is probably why the ideas behind Occam's Razor and KISS speak to me. As a developer working in a world where conventional wisdom says 'technology makes our lives easier', hiding complexity is at the very core of what we do. If you work at a large company making products for large numbers of people, living with unintended consequences goes with the territory. According to Robert Merton (via wikipedia) there are a few reasons unintended consequences exist. Title: Or the same bug 25 times? Snarky: They attached the developer fridge to source control. Now it gives you a code to open in after you check in 25 bug fixes.